Professional veterans of blacksmithing and hobbyists alike can benefit from enhancing their education on anvil uses, types, and parts with our Centaur Forge complete anvil buyer's guide. Use this guide to help make clear any parts or functions of the anvil that may be unknown to you, and reference it as you browse our selection of modern, multi-purpose, and specialized anvils. Though some anvils are made for multi-purpose use, many of them have one or more specialized parts for custom use by professionals in different smithing fields. Farriers take advantage of turning cams on their anvils to help create the sharp radii of horseshoes and make fine adjustments to curvature easier. The blacksmith is a generalist who creates functional metal pieces for use across disciplines and industries. The blacksmith's anvil often has a more rounded horn for creating rings and a flatter face with sharper edges for crafting strong items with consistent corners. Coppersmiths can work copper cold or hot, but working it cold increases the risk of breaking the metal. Because it is so soft, smiths can use any anvil for copper smithing provided it has the surfaces needed to shape the end-product. Functional copper pieces may require a blacksmith's anvil, but decorative pieces may be easier to create with a farrier's anvil. Silver is much more robust than copper; accordingly, it requires a heavy-duty steel anvil to work with. Goldsmithing also requires an anvil with denser metal more tightly packed into its shape. Smiths also work with other metals such as pewter and tin, and can be named for the products they forge such as swords, knives, and arrows. All anvils come with a face and horn. Some anvils have multiple horns, turning cams, and special attached tools for specialty jobs. Face - The upward-facing flat surface of your anvil where most your general work occurs. It may have sharp edges to create tight corners, or tapered or rounded edges to create curved shapes. Horn (Cone) - The angular or rounded piece that tapers at the end and attaches to the face of the anvil. Its roundness allows smiths to forge ring shapes and large curves. Heel - The back of the anvil; may be either squared, rounded, tapered, or may have additional tools or horns attached. Hardy Hole - A square, tapered hole for holding hardy tools such as chisels and bending drifts. Pritchel Hole - A punched hole in the anvil for making nail holes in horseshoes. Youâ€™ll find these most often on farrier anvils, but blacksmiths can also use them for special projects. Turning Cams - Small protrusions in the anvil surface for shaping horseshoes. 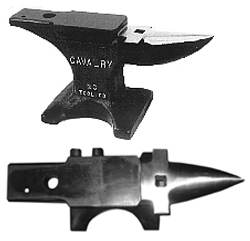 These exist on farrier anvils, but blacksmiths can also use them for material that bends. Two main different types, or styles, of anvil exist that have functionality adequate for most smithing jobs. The farrier anvil is specially equipped to create shallow, rounded edges and deep curves. It often features rounded edges on the face, a broader horn than the blacksmith anvil, and two knobs called turning cams that help make fine adjustments to the shoe. They also often come with a pritchel hole for making nail holes in horseshoes. The blacksmith anvil is specially equipped to create sharp, tight corners and flat surfaces. It is often square at the heel to help keep finished surfaces level. The horn is usually more cone-shaped and not quite as wide as a farrier anvil so that blacksmiths can create ring shapes. Easy production - since casts are premade and need only to be injected with material, you may be able to save money on the front end. High tolerance - more advanced anvil shapes and designs with specialized tools are possible through the casting process. Superior appearance - cast steel can reach levels of detail that would take careful and precise labor efforts to reproduce through forging. Durability - grain flow develops smoothly as the metal is beat to forge the anvil, which makes it particularly long-lasting. 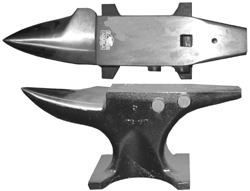 Low cost - anvils can be drop-forged with less expensive materials and fewer specialty tools. Strength - drop-forged anvils stand up to the rigors of working with silver and gold better than cast steel anvils. In general, drop-forged anvils tend to be stronger and longer-lasting, but cast steel anvils allow for more flexibility in function and sometimes command lower anvil prices. What Size Anvil Do I Need? The size of your anvil, measured in weight, should be determined by the size of the items with which you plan to work. 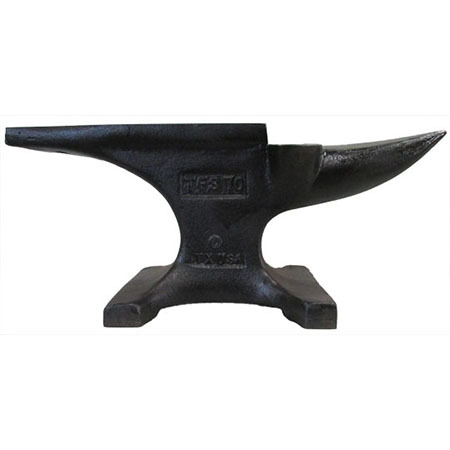 Smaller anvils are not only used by beginner blacksmiths and farriers; they are also particularly useful for master craftspeople such as jewelers. The price of your anvil will vary most often by weight. Though material costs and forging processes factor into total cost, the greatest differences will occur when selecting the weight of your anvil. 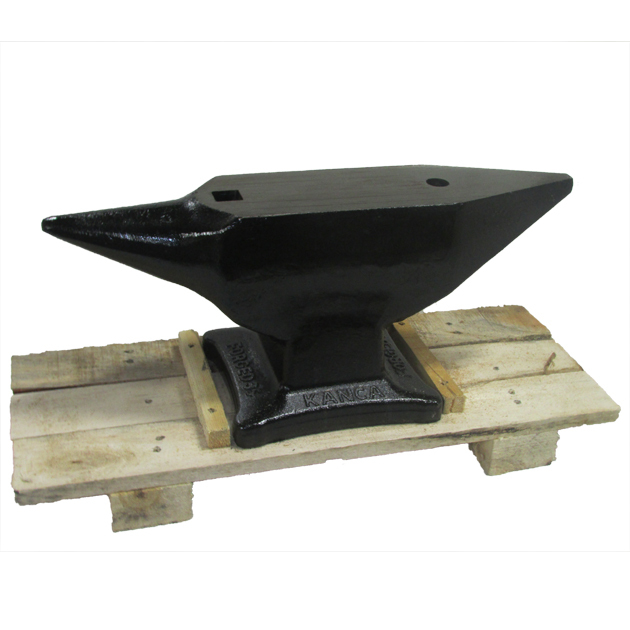 The price of an anvil can range from as little as about $200.00 for a 35-pound anvil to about $2000.00 for a 400-pound anvil. Don't forget to calculate shipping with your costs if you're buying online. Most anvils of professional quality can only be purchased from a specialty retailer. Your retailer will likely be set up with an online ecommerce system and shipping process to ensure that you can pay easily and that you'll receive your items quickly and in new condition. Shop Centaur Forge's collection of anvils and use this buyer's guide to ensure you get the right forge for your farrier and blacksmithing needs.